Programming software which allows to optimise the weighing results. CHECKTOOL and E-CHECKTOOL ENTERPRISE are programmes which allow to quicken the configuration for static or dynamic weighing on belt; advanced calculation functions allow the processing of the weighs made during the testing of the system, in order to improve the precision and repeatability of the scale. CHECKTOOL and E-CHECKTOOL ENTERPRISE are particularly suitables for quickly finding the best configuration of dynamic systems with a high number of packs per minute, or in systems in which the space for weighing is very small. Furthermore, all the configurations can be memorised in order to be quickly loaded on the instruments. 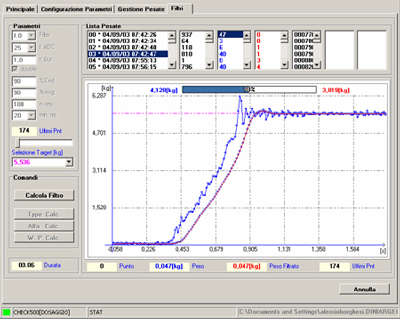 Automatic calculation of the positioning, weighing, and cadence times, through the entry of the data into the system. 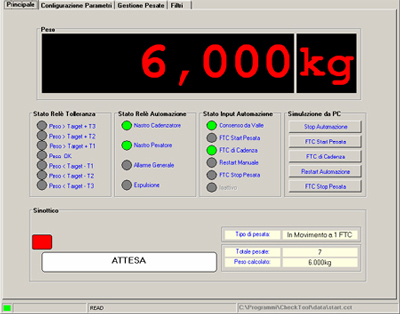 Graphic report of the weighs, with indication of the calculated weight, of the weighing time and of the number of points used for the acquisition. Storage of the configurations and of the weighs. Verification of the correct functioning of the automation relays. Control of the tolerance relays (for the checkweigher). Reading of the status of the instrument inputs. Simulation of the photo cells and of the consensus.